Please feel free to pass this message on to other classmates. I did not have some of their e-mail addresses. Ted  could you please post this notice on the class of 69 page? The Class of 88 will be having a reunion night on Saturday October 27th at 6:00 PM at the Los Cabos restaurant on the Riverwalk in Jenks. We have a semi private room reserved but we do need you to RSVP on Facebook, CHS Class of 88, if you have not already. Everyone will be responsible for their own food & drink so we do not have to collect money. Hope to see you there. A bit more on the 50th Year activities for the CHS Class of 1968 (see below). There will be a slideshow (presented by Ted Wright) at the School Service Center Sat. Sept. 29, 2018 at 1:30pm. That will be followed by a tour of the Newspaper Museum In Collinsville for 1968 classmates and family. WE HAVE A DATE! CHS CLASS OF 1968 WILL have their 50 year reunion THE WEEKEND of September 28-29 during homecoming weekend. Plans will start coming together next spring...will keep everyone posted! The Class of 1987 will be celebrating their 30 year reunion the weekend of September 29 -September 30, 2017. They will kick off the weekend with the Homecoming football game on Friday, September 29 with tailgating beforehand and then get-together on Saturday, September 30 at the Red Barn Event Center at 7:00pm with Trails End barbecue catering, a DJ playing 80s music all night and they have hired a bartender - drinks will be between $5 and $8 and beer will be $2.50. You may now purchase your tickets for the event on Saturday, September 30 at the Red Barn Event Center by logging into PayPal and using the email address collinsvilleclassof1987@gmail.com or you mail a check payable to the "Class of 1987 Reunion" to Overholt Heating & Air, 602 W. Broadway, Collinsville, OK 74021 Tickets are $30 each. Please look for updates on our Facebook page "Collinsville Class of 1987 Reunion" or you may contact some of the committee members: Brad Overholt - 918-724-6500, Sherri Blevins Patton - 918-633-9979, Silvia Hartzog Denny - 918-6987-8628 and Joni Osborne Hart - 918-510-2062. Friday October 7th, 2016 - HS Homecoming & football game. Saturday day October 8th, 2016 - Collinsville City Park Family Cookout. 1:00-4:00 under the pavilion on the east side of the park. Bring the kiddos! If you have any questions, contact our 2006 Class President, Hillary Moore for more info. !!! 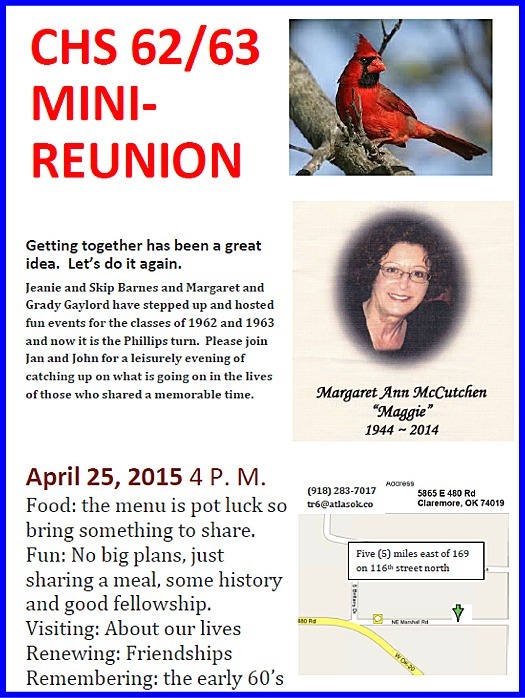 It is time for our 30th Class reunion. Celebrations will begin on the 9th of October during the Cardinal football homecoming game. Game starts at 7:00. This will be followed by an informal get together at the Silver Dollar Café in downtown Collinsville. A family lunch will be held on Saturday the 10th of October at the High School Commons area. This is the only event that needs to be paid for in advance. TO THE CLASS OF 73 & ALL MY FB FRIENDS WHO ATTENDED 69-80:::: (Notice I said "attended" not "graduated only") There will be a HUGE 70's reunion 10-10-15 at the Downtown Doubletree, Tulsa, with hors d'oeuvres, Mid-Life Crisis Band, free parking. PLEASE make your reservations NOW so we can have plenty of food---There will be discounts on rooms (just say you're with Class of 70's Collinsville). If you would like to know more about what's happening, or if you have input, the next planning meeting is Aug 4, 6:30, at the Education Service Center---formerly Baptist Tabernacle, 1902 W Maple. Come on guys---be a part of this!!! Is there a way you can post the following list of missing classmates on the reunion news website? The 1960 class will be celebrating their 50th anniversary on Friday, June 11, 2010, beginning at 4:00 p.m. at the Cherokee Community Center, located at 12th and Cedar in Collinsville. We invite you come and be us that night as our guest, we will also be attending the Nifty Fifties on Sat, June 12th and understand you will be taking pictures at that time. Please submit our upcoming event in cvilleok.com, we have had a very successful response for both nights from our classmates. I can be reached at: 371-3760 - live at 902 N 12th, email: tomsred52@yahoo.com. Carolyn Fugate and I are on the reunion committee along with Kenneth Williams, Gary Riggs, Brenda (Payne) James, Donna (Smaligo) Snook, Gary Winton, Danny Austin. Please advise if you will be available. Plans are under way for a 70's Reunion for all graduating classes from 1970 to 1979. The main event will take place Sept 25 (Homecoming weekend) at the Hard Rock Hotel/Casino-Tulsa. The next planning meeting will be Monday evening, June 14 at 7:00 PM in the Collinsville High School Commons Area. All classmates are invited. Updates and addtional information can be found on the group's Facebook page "CHS -Those 70s Classes." Just update to the Class of 1980 30 year reunion: Sept. 24th we will be participating in the Homecoming Parade, then it's on to cheer the Cardinals on that night. Following the game we will be having a mixer at the Silver Dollar Cafe, and this event is open to all CHS alumni and this is a pay as you go event. Saturday Sept. 25th we will be having a banquet at the Hard Rock Casino & Resort in Catoosa cost is $50.00 per person with activities beginning at 6:30 p.m. Information was mail out this week. Cant come to the Saturday events or maybe you just want to have more time to socialize with everyone. Come and enjoy fun, food, and drinks. This is not part of the Saturday events or fees. Its simply pay for what you consume. Enjoy dinner or just come for conversation and drinks. RSVP: Please rsvp by emailing monacaneel@yahoo.com. We mailed out invitations today (Monday, March 29, 2010). Please allow at least a week to receive, if you do not receive your invitation, we probably have the incorrect address for you. If that's the case, please contact me (monacaneel@yahoo.com) so that we can verify your information and that you receive all the information needed to attend the Reunion. Bring the entire family and join us for hotdogs, chips, drinks and dessert. Come join all your classmates and their spouses or guests for a great evening w/ BBQ dinner, drinks, music and much more. Hard Rock Hotel and Casino, 777 W. Cherokee Street, Catoosa, OK. If you would like to stay the night in the Casino please call 1-800-760-6700 for room reservations. $50.00 per adult includes: Saturday night event and Family picnic - Children are free at the picnic. Golf and other get-together opportunities will be communicated in future correspondences. 8/21/2009 Update: We are planning the class of 1999 ten year reunion and are missing contact information for the following people. Could you please ask them to call me at 918-697-4248 or email Jessica@tulsacoxmail.com if they are interested in attending the reunion events on September 25th and 26th? (6/22/2009) Class of 1999 reunion planning is underway. Please contact Jessica at 918-697-4248 or Jessica@tulsacoxmail.com with your address so we can get you on the invitation list. if you are interested in receiving an invitation contact me ASAP. We are looking at Sept the 26th at the Cherokee Casino. We need all addresses for the invitation list to keep everyone informed on dates, times, etc. (5/26/2009) Just an update on the 20 year reunion for the Class of 89. It will be the evening of Sept. 26th at Cherokee Casino in Catoosa. We are in the planning stages for a family picnic that weekend and the details of the reunion that evening. We need addresses!! Please email any one of the following if you have any information to pass on or would like to help us plan. The following ten met 8/15/2009 at the Collinsville library and will meet again Sept. 19, 2009 4:30pm at the Library to make further plans for a reunion next year: Sat June 26, 2010. It was decided quickly that it was just too late for anything during this 40th anniversary year since our graduation. Joyce (Lowen) Cribbet and Sharon (Floyd) Shaw agreed to lead the reunion planning effort only on the condition that they get a ton of help from the rest of us. The initial help needed is to locate as many classmates as possible. The ten present today split the name list and will try to get out the word on additional planning meetings and the eventual reunion. Joyce Lowen Cribbet, Sharon Floyd Shaw, Brenda Clark McDoulett, John McDoulet,Coleen Troglin Breshears, Wendell Harrold, Don Witten, Larry Gannon, and Ted Wright . The CHS Class of 1958 celebrated the 50th anniversary of their graduation as part of the Nifty Fifties Reunion in June 2008. Contact John Combs (Combsjoh3@aol.com). The class met at the Middle School June 13th and then again with the rest of the Nifty Fifties June 14th. The Nifty Fifties Reunion this year (2008) will have the largest turn out since the first year we started (2000). We have two-hundred and eighty (280) reservations in with the deadline closed. We will be honoring the Class of '58 as they celebrate their 50th year since graduation in 1958. 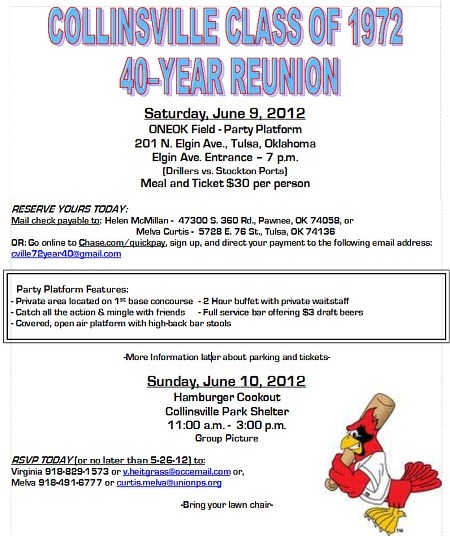 We have also invited the Old Timers Alumni Association of which 49 have responded to our reservations. This will be our 9th Annual Reunion. It will be held at the Collinsville Middle School beginning with a bus tour of the construction, new homes, churches, and shopping areas now available. The reception will begin at 3:00 p.m. With endividual class photos beginning at 5:15 starting with the Class of '50 and ending with the class of honor, 1958. The reception will be held in the middle school library. The Class of '58 will be introduced individually prior to the banquet which is to start at 6:30. Escargot of Tulsa will be catering again this year. Ron Evans, co-founder of the Nifty Fifties, will serve as the emcee. After the introductions, pledge to the flag, invocation, and welcome the seven $1000 recipients of the Nifty Fifties ($4000), Collinsville Education Foundation ($1000), and Old Timers ($2000) scholarships will be introduced and presented with photos of their high school activities. Those students are: Jarrod Shearer, Tara Inbody, Rachel Morgans, Raelynn Moore, Michael Pitts, and Lizzy Schultz. A framed photo of Jarrod and Tara will be sent to 1952 graduate, Norman McKinney CEO of UNChildren, which gave $2000 to the Nifty Fifties scholarship program. Those pictures will be hung in the company headquarter's office. This will make16 Collinsville Seniors who are displayed at UNChildren in Boulder, Colorado. After dinner, John Combs of the Class of 1958 will present an incredible CD that he has made honoring his class, those Nifty Fifties members who served in the military (it is nothing short of sensational), and a look back at Collinsville in the past. After announcements , door prizes, and special presentations the group will adjourn and begin plans for Reunion 2009 which will be honoring the Class of 1959. The theme will be "Aloha to the Fifties". A few Prior Reunions can be found on the history index on cvilleok.com. Anyone wishing to post his/her e-mail address or reunion plans to this site, please send to: wrightted@aol.com. Include the year of graduation and any other information you wish to include.